As a pure geographical diversity, few places in the world are as richly endowed as Uttarakhand / Rishikesh is. Low rolling hills, just a couple of hundred meters above sea level, climb on to touch the core of the Himalaya Mountains. Here lie peaks that are several thousand metre's high and never lose their perennial snows. Then, past these forbidding heights, lie visually stunning cold deserts of the Trans Himalaya. Rivers in deep gorges and placid mountain lakes, thick forests and acres of scree, mountain sides draped with snow and green. Alpine pastures all form a part of this immense spectrum. This variety of nature also opens immense possibilities for a wide range of outdoor activities, sport and adventure. There are day-hikes by the thousand-while trek routes follows trails that can last a couple of days and extent to a few weeks. These vary from gentle walks over easy terrain to grueling expeditions. In winter sports, there is skiing, heli-skiing and ice-skiing. There is the thrill of mountain climbing. You can also go camping, white water rafting and safari by car. 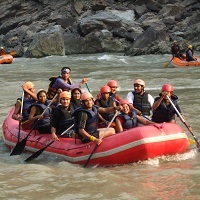 Sedentary or strenuous, for the expert or beginner, Uttarakhand / Rishikesh has a niche of sport and adventure for everyone. Tayal Tour & Travels provides the excellent offers for the tourist where we are understand your money value.